Identification: The shell of this species is transparent to slightly translucent. With growth, it becomes proportionately more elongate and, in fully mature animals, the outer lip becomes slightly thickened. Very small shells (up to 2-3 mm) have fine, evenly spaced axial folds and spiral striae completely covering their surfaces. In larger shells, that sculpture becomes progressively restricted to the apex and base. 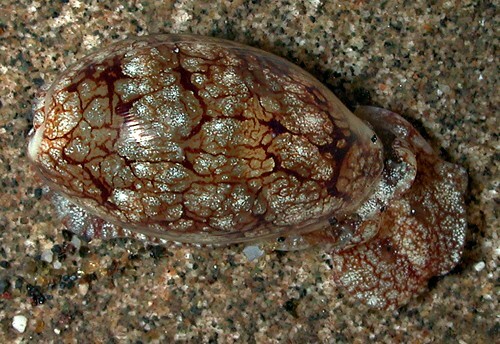 (see photo) The animal is cream to olive-brown, flecked with white, and a dendritic network of red-brown lines shows through the shell. Natural history: Diniatys dubius is moderately rare in mixed habitats and sand channels at protected to moderately exposed sites where it occurs at depths of as little as 1 m (3 ft). However, it is one of the most common Hawaiian haminoeids in Halimeda kanaloana beds at depths of 9-29 m (30-95 ft). Dredged shells from the Bishop Museum extend the depth range to at least 183 m (600 ft). It appears to be largely nocturnal in habit but mating aggregations of up to several dozen animals may remain in the open during the day in the Halimeda beds. It probably feeds on cyanophytes growing both on the sand and Halimeda. It lays a spherical white egg mass that is more flaccid in texture than that of most haminoeids. In the field, the egg masses are usually attached to the tips of Halimeda branches, decorating them like Christmas tree ornaments when the population is high. (see photo) The eggs hatch in about four days in the laboratory. Distribution: Maui, Oahu, Kauai and French Frigate Shoals: widely distributed in the Indo-Pacific. Taxonomic notes: This species is listed in Gosliner, et. al. (2008), as Haminoea sp. 2. Immature shells at the Bishop Museum labeled Atys costulosa Pease, 1869b appear to be this species as do mature shells labeled "Diniatys monodonta?". It's also probably the species listed as Atys costulosa in Kay, 1979. It was probably first reported from Hawaii in Pease, 1869 (as Atys costulosa). However, the illustration of Atys costulosa in Pilsbry, 1917 and its description in Edmondson, 1946 seem somewhat ambiguous. In many sources it's listed as Diniatys dubia. Photo: CP: 19 mm: Wahikuli Park, Maui; May 1, 2005.